As TotalRP (and probably all RP addons) were updated for 8.0 there seems to be an incompatibility at the moment. I've sent the issue to the current LibMSP maintainers so they can take a look as well in case it's coming from there. Edit : ttCore.lua Line 1360 should be msp:Request, not msp.Request. The old version was incorrect but silently failing because self wasn't used. LibMSP was rewritten for 8.0, keeping the same syntax but using self, causing issues in this case because it can't find self. Thanks for the information you posted. That issue is now fixed. Truth be told, I don't believe this code was ever truly tested. Looking at the changelog, the entry does say Added experimental code to support the "Mary Sue Protocol". But there was never any bug reports for it, until now. 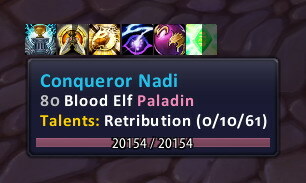 I'm unsure if there is anything else TipTac could do to better support RP addons, but if so, post them here. I close it therefore. Thank you so much for fixing it. I assume it will be then in the next build.